Gosha and Dunham are getting the Criterion Blu-ray treatment in February. In an early announcement to retailers, Criterion is working on 'Three Outlaw Samurai' for Blu-ray on February 14. The Blu-ray will feature a 1080p transfer, uncompressed mono soundtrack, and supplements will a booklet featuring an essay by film critic Bilge Ebiri. 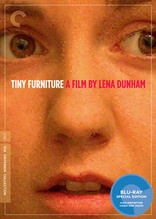 Lena Dunham's 'Tiny Furniture' will also be available on Blu-ray on the same date. As painfully confessional as it is endlessly amusing, Tiny Furniture is an authentic, incisive portrait of a young woman at a crossroads. The Blu-ray will feature 1080p video, a DTS-HD Master Audio 5.1 soundtrack, and supplements will include: Director Lena Dunham talks about filmmaking and autobiography in a new interview with writer and filmmaker Nora Ephron; New interview with writer-director Paul Schrader; Creative Nonfiction, Dunham's first feature film; Four short films by Dunham; Trailer; and a booklet featuring an essay by critic Phillip Lopate. You can find the latest specs for 'Three Outlaw Samurai' and 'Tiny Furniture' linked from our Blu-ray Release Schedule, where they are indexed under February 14.